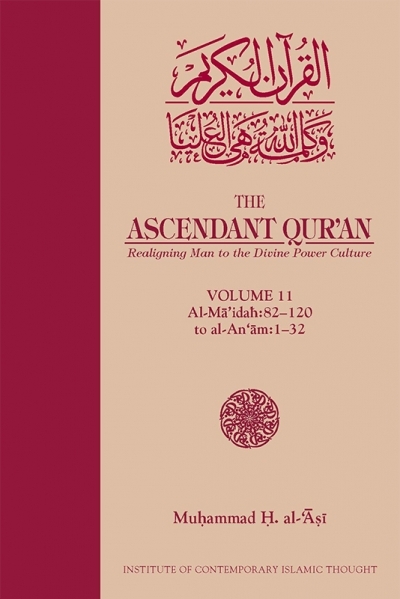 In this volume of the tafsir, The Ascendant Qur’an: Realigning Man to the Divine Power Culture, by Imam Muhammad H al-‘Asi, the last portion of Surah al-Ma’idah (ayat 82–120) and the first 32 ayat of Surah al-An‘am are covered. Surah al-Ma’idah was revealed in Madinah. As for Surah al-An‘am, a Makkan surah, there is general consensus among scholars that it was revealed in the last year of the Prophet’s (SAW) mission in Makkah before he was forced to seek sanctuary in Madinah. As our Creator and Sustainer, Allah (SWT) is fully aware of our capabilities as well as weaknesses. That is why He provides us guidance so that we may distinguish right from wrong and make the right choices to earn His pleasure and avoid His corrective justice. But given the human tendency to fall into error despite divine revelation and guidance, Allah (SWT) provides constant reminders as is evident from the last ayat of Surah al-Ma’idah. One of the more consequential themes running through virtually all the surahs of the noble Qur’an relates to Allah’s (SWT) authority. Humans are prone to not only forget, but also become arrogant, often as a result of some minor achievement in life. This can easily lead people to think they are self-sufficient unto themselves. As with individuals, so with societies — hence the rampant racism, tribalism, discrimination, and classism so widespread in the world today, borne out of a sense of self-importance and air of superiority. Such tendencies do not arise — or are kept in check — when people subsume their potential hubris to their compliance with Allah (SWT), recognizing and opting for His authority as the sole decision-maker and Creator. When we defer all matters to Allah (SWT), we rest assured that the many who suffer from poverty and injustice at the hands of the few who are born into privilege, power, and wealth will be relieved. In the formative phase of Islam, when such decisions were placed in the hands of committed Muslims, a din belonging to Allah (SWT) took center stage, with all matters being referred to His Book of justice and His Prophet (SAW) of mercy. These early Muslims, who were just emerging out of the pre-Islamic jahiliyah (ignocracy), became the most upright human beings on earth, indeed pacesetters for all humanity. At the end of Surah al-Ma’idah, Allah (SWT) again reiterates the urgency to establish an ummah. Not a call to exclusivity — Islam is inclusive — it simply reflects the fact that only a body of people committed to the standard of Allah’s authority, which inevitably engenders a society founded upon undiluted doctrine and patterned on the prophetic archetype, can establish the din of Allah (SWT) on earth. This Ummah is not dependent on, conditioned by, or relative to any other ideology or philosophy because divinity and authority belong exclusively to Allah (SWT). Therefore, man’s developmental programs, legal procedures, value system, and political orientations, by necessity, would be a derivative of this central fact and core belief. At the beginning of al-Ma’idah, Allah (SWT) clarifies for us what is halal (permissible, and thereby good for man) and what is haram (prohibited, and thereby detractive from man’s mission on earth). This theme is revisited at end of the surah together with a reminder that whatever Allah (SWT) has made lawful cannot be made unlawful and whatever He has prohibited, no human being can make lawful. This was an admonition directed at the Yahud because they had a tendency to make their own rules about halal and haram in contravention to what Allah (SWT) had ordained. The last few ayat also outline regulations for transactions, prohibition on intoxicants (khamr), gambling, betting, and other such practices, as well as prohibition on hunting while in ihram (state of ritual consecration, made evident in the case of Muslim men by the two pieces of white, unstitched cloth worn at the time of ‘Umrah or Hajj). The issues of the sanctity of the Ka‘bah and the sacrosanct months in the Islamic calendar are also dealt with in this surah as they are in the surahs preceding it. The final ayat of the surah correct the distortions prevalent among Christians about Jesus and Mary (AS). While the Qur’an narrates the miracles performed by Jesus, it also emphasizes repeatedly that these miracles occurred only with Allah’s (SWT) leave and permission. The issue of the so-called divinity of Jesus and his mother (AS) is also discussed, with Jesus himself countering such a claim when all humanity is relocated in time to the Day of Judgement (Accountability). There, he denies all this “Christian theology” about his “divinity,” and everyone on that day and at that time will be witness to this exoneration. And as it should be with all issues theological, Jesus (AS) turns over the whole affair to his Lord and Sustainer and the Sustainer of all humanity — Allah (SWT). While the Qur’an talks about the animosity of the Yahud and Nasara, this refers to political Jews (Zionists) and political Christians (imperialists), not to scriptural Jews or scriptural Christians. This distinction is important because the Zionists and imperialists have deliberately obfuscated these lines and some Muslims either out of ignorance or an inferiority complex have swallowed this propaganda. The result is that despite the horrors the Zionists and imperialists have inflicted upon millions of innocent Muslims, the latter are unable to confront this reality head-on. Yahudi animosity — much more intense than that of the Christians — predates Islam. The Qur’an tells us that long before the establishment of the Islamic State in Madinah, Yahudi anger and intransigence had already led to their murdering the messengers of Allah (AS). With the advent of the Muhammadi era of scripture in Arabia, the mischief-making Yahud did not all of a sudden part with their belligerent predilection; rather, they renewed their antipathy to Allah’s (SWT) din and aversion to its main representative, even making common cause with the mushriks. What is puzzling — and troubling — is that while these Qur’anic instructions live on, their upholders — the Muslims — have virtually faded away from carrying these responsibilities. Part-time Muslims engrossed in rituals need to come back to the confidence-building meanings of the noble Qur’an so that they will know how to move forward in life without being confused about “who is a friend” and “who is an enemy.” This impeccable Qur’an enables them to do so. 4. Years 10–13 were the most difficult in the life of the noble Messenger (SAW). At the end of the siege, he lost two of his closest companions and supporters — his wife for 25 years, Khadijah, and his uncle Abu Talib, who had been able to protect his nephew from the vicious attacks of the Makkan chiefs due to the security guarantees that were still honored by the power factions of Makkah. With Khadijah’s passing, the Prophet (SAW) lost the one person who had provided him comfort and solace at home, and with Abu Talib’s, he became vulnerable to physical attacks and threats of murder. It was at the end of this grim period that there was an explosion of divine mercy. An opening emerged in Madinah where some of the people of the two dominant power factions there, the Aws and Khazraj, were more amenable to the message of Islam. This stood in sharp contrast to the attitude of the haughty and arrogant mushrik chiefs of Makkah. Say [O Prophet], “I do not say unto you, ‘Allah’s treasures are with me’; nor [do I say], ‘I know the things that are beyond the reach of human perception’; nor do I say to you, ‘Behold, I am an angel’; I but follow what is revealed to me [from on high]” (6:50). In another surah, this point is reiterated, “Say though, [O Prophet], ‘I am but a mortal like you. It has been revealed to me that your god is [the] One God: go, then, straight toward Him and seek His forgiveness!’” (41:06). Al-An‘am and the surah immediately following it in the noble Qur’an — al-A‘raf — are the two longest surahs revealed in Makkah. Thus, while they emphasize the three principal themes — Allah’s Oneness, power, and authority; prophethood; and the Day of Judgement — they also contain other themes relating to life in this dunya as well as the hereafter. The rejection of false deities is constantly emphasized, as is the propagation of the oneness of Allah (SWT). Values, customs, and systems based on erroneous beliefs are rejected while Islamic principles are outlined in general terms in preparation for the more specific injunctions to follow in the Madinan surahs. The deconstruction of jahili practices was necessary to prepare the society for the implementation of divinely ordained principles. With the multiplicity of gods the mushriks sought guidance and comfort from — gods they had crafted with their own hands out of stone or wood — they also believed that one of these gods was Allah (SWT). This reflected their warped thinking. Into this prevailing environment, the proclamation of la ilaha illa Allah came as a political statement, an ideological manifesto, and a doctrinal gauntlet. It was a rallying cry for political opposition to the status quo. It was a revolution against economic vested interests and political elites who had stealthily reserved the “authority” part of divinity for themselves while remanding God to His spiritual matters that could not, for all practical purposes, effectively impact their established ways, historical precedents, or control of people’s lives and institutions. It was true then, during the formative phase of Islam, and it is true today — in fact much worse since the power elites, business leaders, top executives, and moneylenders have usurped the power and authority of Allah (SWT) and become far more entrenched. The Islamic ideological article of commitment to Allah (SWT) — the shahadah, expressed as ashhadu an la ilaha illa Allah, wa-ashhadu anna Muhammadan rasulu Allah — is an opposition statement and movement against all the power elites who have extracted and abducted authority from God and given it to themselves. It is a cry against the tyranny of power, the exploitation with money, and the temporal authorities and governments of man when he is on a collision course with God. Muslims are the ones who need to understand that their verbalization of la ilaha illa Allah means they are rebels against man-made and man-centered governments — governments that have institutionalized an un-authoritative God through religions that answer to kings and presidents, monarchies and democracies, and are not to be bothered by the authority of Allah (SWT). This absent understanding is what the masses of Muslims and the masses of the oppressed people around the world need to revisit. And when this lost meaning is regained, it will empower a revolutionary movement of people who will, by Allah’s (SWT) will, topple dictatorships, collapse monarchies, and destroy illegitimate regimes. It is precisely because of this “lost meaning” that the ruling classes of Arabia in those formative days went to war, in every sense of the word, against the Islamic ideological and political opposition to a world void of the kind of impartial justice that can only come from Allah (SWT). And it is also because of this reason that the Zionists and imperialists are at war with committed Muslims today. It is only by engaging the noble Qur’an and its penetrating words that Muslims can break out of their stupor and break free of their oppression to assume their responsibility in this world. This tafsir by Imam al-‘Asi is meant to provide this valuable service. As with earlier volumes, this volume too is edited by Br. Afeef Khan. Copious endnotes and references have also been provided to assist those who want to delve deeper into the subject matter to pursue their research activities. Thanks are also due to Br. Imran Khan and Br. Redzuan Shaw in providing timely and expeditious proofreading of the many pages in this volume. As with all the earlier volumes, an electronic version of this volume is also available for reading, or download, from the ICIT digital library (www.icit-digital.org). A hard copy is available through ICIT directly or through various on-line book retailers. Thanks and gratitude are due to all those who have helped in whatever way to bring this volume — and the earlier ones — to fruition. Without their help, support, and encouragement, it would have been extremely difficult if not well nigh impossible to reach this far. Their reward is with Allah (SWT). May He, the Most Merciful Lord and Sustainer, multiply their contributions many times over. Amin.